Madhyapradesh VYAPAM Invited application for 9235 Posts of Patwari,All Eligible Candidates can View and apply for the posts through online application on or before 11.11.2017.For More Details Like Educational Qualifications, Admit Card, Previous Year Papers,Age Limit, Selection Process, Results, Interview Questions ,Syllabus Visit : http://examexperts.blogspot.in/. 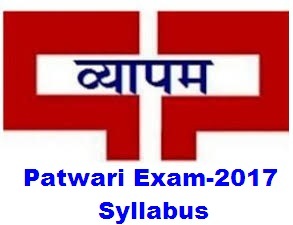 All the candidates who applied for the posts is searching the Syllabus,Paper Patter, Papers, and Others details ,The Official exam pattern is updated at the official website.Here we are provided the all details in simple way.It is an Objective type Written Exam i.e. Test will have Multiple Choice Questions. Information Technology & Society etc. Translation of English Sentences into Hindi etc.